Kirk Hopper Fine Art is pleased to welcome our third solo exhibition for artist Bryan Florentin, entitled Accretion/Churn. This exhibit will feature Florentin's most recent photography and mixed media sculpture. Temporary Landscape 35, 2016, inkjet print, 20" x 30"
Florentin's newest work focuses on temporary manifestations of materials (gravel, rocks, soil, plastic sheeting, rebar, etc.) within the mostly urban landscape. The DFW area is one of the fastest growing in the nation, generating an explosion of new construction. Florentin investigates this abundancy of raw material, not through directly documenting construction, but the tendency for material at the sites to get arranged into heaps of mass. Typically, material on construction or demolition sites disappears pretty quickly, but in some instances it seems to have been forgotten or abandoned. Florentin states, "photographs do what photographs usually do; they make a landscape that is always in flux seem to be static." However static the photographs may be, they also document examples of the churn of human activity. Accretion is as much about cultural accumulation/layering as it is about physical material. Constantly extracting, separating, and mixing materials to make other materials to build structures (roads, parking lots) that alter our landscape, proves that we are indeed restless creatures churning day in and day out. Bryan Florentin approaches photography and installation in various ways, often exploring the ontological aspects of images and objects. 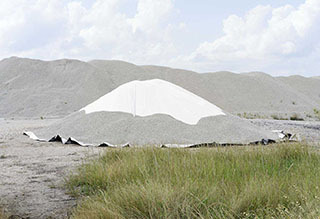 Recent work has been exhibited at various venues nationally including FotoFest (inter-biennial) in Houston and at the Houston Center for Photography. An active member of Society of Photographic Education (SPE), Bryan is currently Chair of the South-Central Chapter. He has served on several SPE committees including peer review, various national and regional conference committees and an ad hoc committee to define the structure of the LGBTQ caucus. In 2013, he curated the exhibition Materiality and Identity: Garth Amundson, Pierre Gour and Paho Mann and wrote the catalogue essay. The exhibition was held at the Gallery at the University of Texas at Arlington (UTA) where Bryan is a Senior Lecturer. He holds an MFA in photography from the University of North Texas and a BA in art and performance from the University of Texas at Dallas. 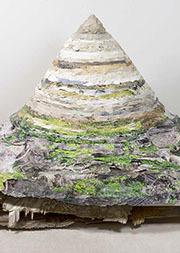 Accretion (bisected witch's hat) (detail), 2017, mixed materials, 72" x 34" x 37"